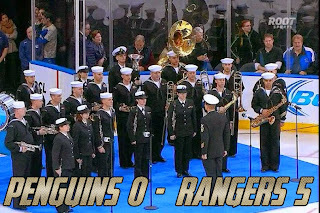 The Tuesday night matchup between the Penguins and Rangers was dominated by fast paced action that saw the home team generating the majority of the quality scoring chances, receiving the majority of the lucky bounces and recording the only goals that would go up on the board. On a night that promised to add a little scoring punch to an already hot Penguins team via the return of Beau Bennett to the lineup, offensive production from arguably the league's hottest team just wasn't there. Bennett replaced the largely ineffective Zach Sill, logging 9:35 TOI with a shot on goal. 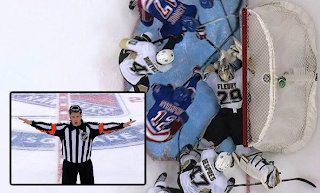 Just a minute and change into the first stanza, Sidney Crosby headed to the box for interfering with Mats Zuccarello, a call that put the Rangers' power play - ranked 24th in the NHL - on the ice. 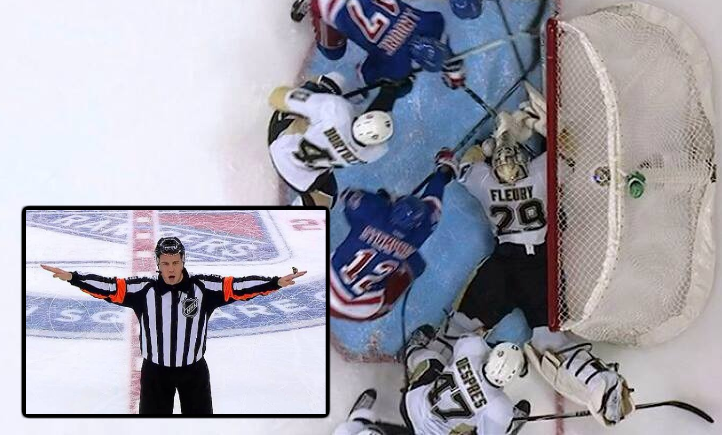 The Pens would kill the captain's penalty off, but it wasn't due to a lack of effort from Rick Nash and crew. In that two minute span, the Rangers were able to register 5 shots on goal. 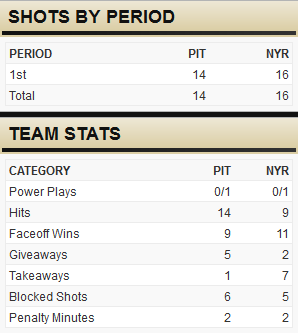 By the first TV timeout, the Rangers would hold a 9-3 edge in shots on goal. At 8:23 of the first, Zuccarello would open the scoring after New York's Derek Stepan cleanly won a draw against Marcel Goc to the left of Marc-Andre Fleury. 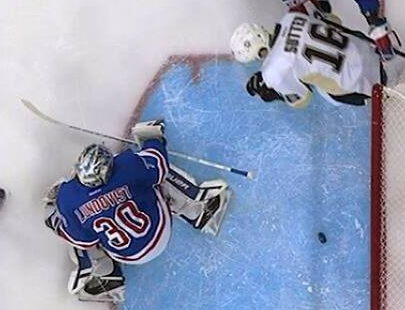 Zuccarello ripped a wrister past Fleury's glove. Moments earlier, the Pens were literally inches away from scoring a goal of their own, as a Nick Spaling shot trickled through Henrik Lundqvist's five hole. The Rangers escaped that bullet however and that sequence would be indicative of how the first period was shaping up. Every goal he scores is a shorty. Minutes later, Martin St. Louis would get a goal of his own on a bang-bang sequence after Pens defenseman Christian Ehrhoff attempted to clear the puck from behind the cage. 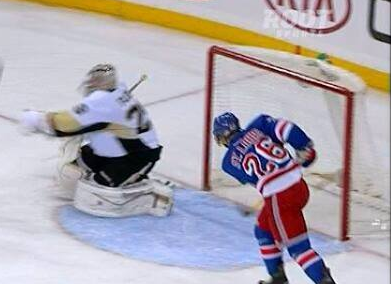 His backhand attempt came off the boards to Marc Staal's stick who then fired a slap shot at Fleury. The rebound came out to Nash who sent it across to St. Louis who had a look at 24 square feet of net. The official time of the goal was 10:59 and the Rangers were not done. At 14:47, the puck kept bouncing the Rangers' way. As the Rangers worked the puck along the right boards, forward Kevin Hayes attempted to chip the puck back to the point. Nick Spaling had good position to intercept the puck but it came off of his skate hot and directly to defenseman - not actor - Kevin Klein who one-timed it past MAF. Former Penguins-for-a-day Lee Stempniak got a secondary assist on the goal that made it 3-0. The clock would have finally have mercy on the Pens. At the end of the period, Derek Stepan would be in the box for hooking Pascal Dupuis in the offensive zone, but the damage had been done. 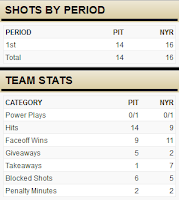 The Rangers were dominating on the scoreboard despite all of the similar numbers statistically. The Pens first power play would go unfulfilled after carrying over into the 2nd period as the Rangers successfully stymied the Pens power play. The first half of the second period was largely uneventful, save for some scoring chances for both teams and a Patric Hornqvist roughing call. The only break MAF could catch. However at 9:15, New York created all kinds of traffic in front of MAF, resulting in a near-goal situation. Upon review, it was ruled that the goal would not count due to the peppered goaltender having covered up the puck enough to warrant a whistle before it was jammed into the back of the net. However, Steve Downie found himself in the penalty box for roughing John Moore after the sequence This time, the Rangers' power play would capitalize as Derick Brassard sniped the top shelf of Fleury's glove side from the left circle with a highlight-reel wrist shot. The goal would round off the scoring for the period. This game, for all it's similarities on the stat sheets, was clearly a Tale of Two Goaltenders. One, dressed in blue, simply could not be beaten. The other couldn't catch a break. Neither had faced less than 10 shots on goal in a period to this point and the wide-open play that characterized the first 40 minutes of play. The third period opened with the Penguins quickly going on the power play as Dan Girardi went off for hooking Crosby a minute in. Nothing. Then, at 7:33, former Penguin Tanner Glass went off for boarding Simon Despres. Nothing again. Worse than "nothing," actually as the Rangers sent a puck deep into the Penguins zone and simply outhustled the team with the man advantage. 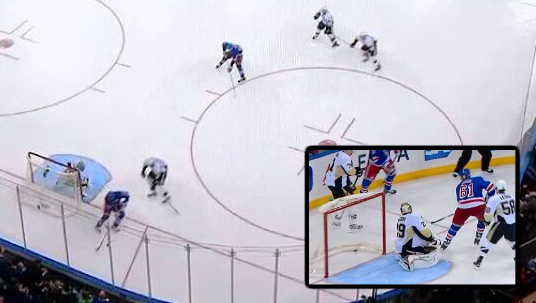 Derek Stepan chased the puck into the end boards to the right of Fleury with Evgeni Malkin hot on his tail. Rick Nash cut to the slot while Kris Letang and Crosby lazily pursued on the play, giving the Rangers captain the time and space he needed once he received Stepan's pass to make it 5-0 Blueshirts. The shorthanded goal was the Rangers' first of the season. And that's the way it would end. A few solid pushes from the Pens met by King Henry who, whether through great play or great luck, refused to be beat.